At a recent talk in Seattle, Mike Rayfield of NVIDIA got up and spoke about all things performance, particularly in the mobile sector. There is no denying that the power has grown in mobile phones, we have seen the first quad-core mobile processor, Tegra 3, be released by none other than NVIDIA themselves. Rayfield explained how at the current rate, processing power in mobile devices are now almost at the level of an everyday gaming console in the coming years. 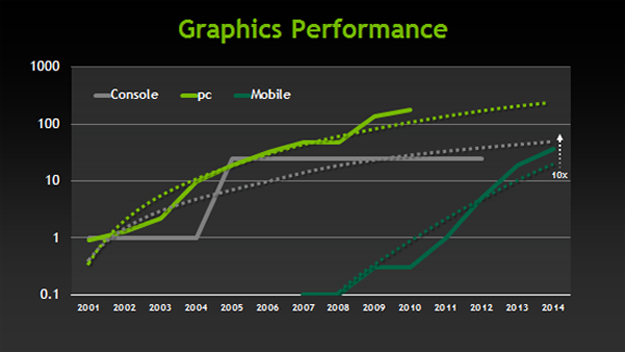 What this graph doesn’t show however is the next generation of consoles that are going to be out by 2014. They will have much more power than this estimate shows. I am all for the Temple Runs and Cut The Ropes on my phone but can ever see my phone or tablet replacing the console that I have next to my TV. I’m anxious to see what developers can do with all this new power, but on the flip side am fearful of what it’s going to do to my battery. Do you guys want to play Halo 4 or Call of Duty: Black Ops 2 on your tablet or phone?